This psychometric tool has a specific chapter which can help in the development of selling skills. The Profile looks at how we perceive the world, our preferred style, recognising the style of others, adapting and connecting. Specifically, when applied to Selling and Account Management, it considers an individual’s approach within the selling process and the relative strengths and development areas an individual may have. 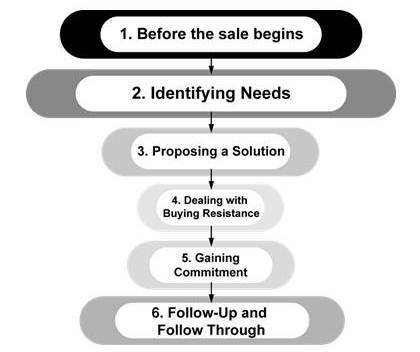 These steps are the core of most sales processes. The Insights model looks at the behaviours in each step, considers the colour energy which is needed and evaluates the relative strengths of the individual. For example, within the ‘Identifying Needs’ step the four behaviours and skills are evaluative. In this example the sales person is likely to be good at using his Green supportive energy to question and listen effectively, but needs to consider how he could use his motivating Red energy to create opportunities. By considering all six steps an individual can create an Individual Development Plan to increase sales. "We have seen real sales growth since we have embedded the Insights into our sales process."